Fifty-two lawmakers voted for the bill, which openly violates a 1994 interim agreement between Israel and the Palestinians. Only 10 refused to greenlight this distortion of the interim agreement regulating economic ties between Israel and the PA under which Israel commits itself to collect taxes for the Palestinians (e.g., customs import duties and income tax deducted from the pay of Palestinians working in Israel) and transfer these revenues to the PA.
Hadash Knesset member Dov Khenin (Joint List) said during the parliamentary debate on the bill that Israel was not doing the Palestinians “any favors” by handing over the money and was not doing so out of the “goodness of its heart.” According the Communist MK, “this is part of a neo-colonial scheme between Israel and the PA.” His fellow party member Aida Touma-Sliman suggested changing the language of the bill to replace the word “deduct” with “steal.” In addition to a total of eight MKs from the Joint List who were present in the plenum for the vote, only two Knesset members from the left-wing Meretz party opposed the proposed law. Twelve Zionist Camp Knesset members and eight members of Yesh Atid, both opposition parties, voted in favor of the bill. 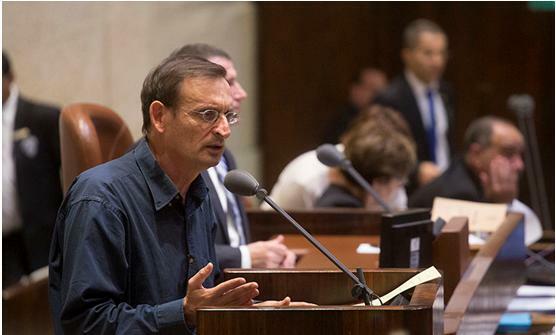 “Nonetheless, Knesset members are energetically promoting a series of proposed bills that could indicate the agenda of the coming election campaign. Prime Minister Benjamin Netanyahu may avoid starring in television and radio campaign advertising spots in light of his many ongoing criminal investigations, but his hallmark slogan and the title of the book he published in 1995 — Fighting Terrorism — will continue to take center stage,” said Eldar.